Halloween’s gone, Bonfire Night happily fireworked, quick, quick, let’s light up the early falling evenings with some Christmas cheer! 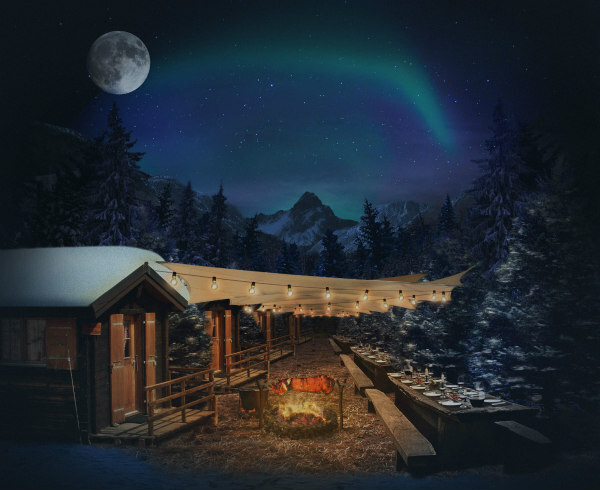 Forget pubs for a while, street markets are the new fun and Little Feast has just reopened in Shepherd’s Bush Yard with a festive Scandinavian forest feel. There are three different places to try: the bar under the brick arches serves mulled wine and cider as well as craft beer, the pergola is decorated with ivy and fir branches, even with blankets for a comforting touch. The rest of the yard is covered with a transparent roof (to get a glimpse of the stars! ), zigzagged with fairy lights – on one side, 5 wooden sheds for street food, on the other candles on the tables, fur on the benches, Xmas trees twinkling nicely. There is more – from December 13, Street Feast will be selling Danish Xmas trees too. There will be acoustic live music on Saturday and Sunday daytimes with choral choirs, carol singing, brass and jazz bands and even a giant Advent Calendar from November 23rd with food and drink offers located behind each door. I’m rather intrigued by the strictly for grown-ups ‘dirty Santa’s Grotto’ (if you have been naughty, rather than nice). We hope to see you again for more Cheesy Fresh and Cut fries.